Crossbow limbs for pistol crossbows. Replacement 50lb Fibreglass Limb / Prod / Bow for 80lb Pistol Crossbows. 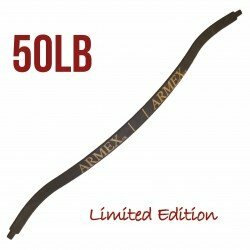 (Do not use on 50lb crossbows)This is a one off limited edition only 7 availableThe standard 50lb crossbows use a strangely shaped metal limb, so you can't use them 80lb crossbows. However this limb is a stan.. Replacement FibreglassLimb / Prod / Bow for 80lb Pistol Crossbows..
Camo Fiberglass Crossbow Limb Prod for our Jaguar Crossbows..